The second edition of the revised Family History Documentation Guidelines has illustrations and examples of source citations from numerous types of sources. The 116-page wire-bound reference book is an accessible collection of detailed recommendations, instructions, and examples for entering source documentation. 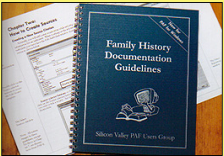 The first edition, published in 1992, set the standard for source documentation in genealogy software. This revised edition, with examples from PAF 5.2.18, continues that tradition.